Baked Crispy Chicken Thighs! 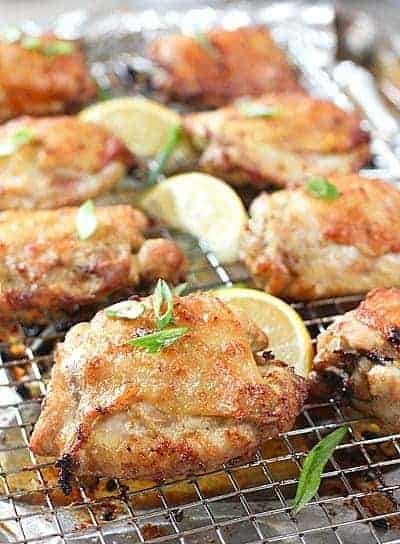 A simple rub of garlic, green onion, lemon and olive oil is all it takes to bake up these crispy yummy chicken thighs! Be still my fried chicken loving heart! Check out these crispy little beauties! Baked on a rack to ensure that every last bite is all crispy and crunchy! And did I mention Paleo and Whole30 compliant? Yay! I wanted to find a crispy chicken recipe that didn’t have to marinate over night. The trick is to combine all your marinating ingredients in a blender or food processor. It makes a super amped up marinade that only needs to sit for about 20 minutes while your oven preheats. After mixing up your magical marinating brew, get your hands in there! I mean rub a dub dub all over and under the chicken skin. Then just let it hang out for about 20 minutes and off to the oven it goes! Don’t you love pics of raw chicken with green flecks on it? Yumbo! But I wanted you to see how easy this is, and how just a few ingredients can turn regular chicken into wow chicken! Not a great pic…some bloggers might not even put it on their site…mmmm, well, I’m doing it for your own good, taking one for the team! If you don’t have a wire rack, don’t sweat it, simply lay it right on a foil lined sheet pan. I borrowed this technique from nomnompaleo.com. She uses it for her Lemongrass Chicken…but alas, no lemongrass in my fridge so I adjusted the recipe to use what I had on hand. You could easily add grated ginger, rosemary or other herbs to change it up a bit. Looking for more uses for your sheet pan? Check out my favorite 6 Sheet Pan Dinners! More Whole30 Recipes! Even if you are not on the plan you will enjoy the freshness of all my Paleo and Whole30 recipes! Who says healthy has to taste like healthy food! …To healthy meals that don’t taste like healthy meals! 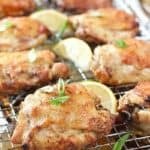 Chicken thighs that really do taste like fried chicken! An easy and flavorful way to get crispy chicken thats healthy! Line large baking sheet with foil for easy clean up and set rack on top. 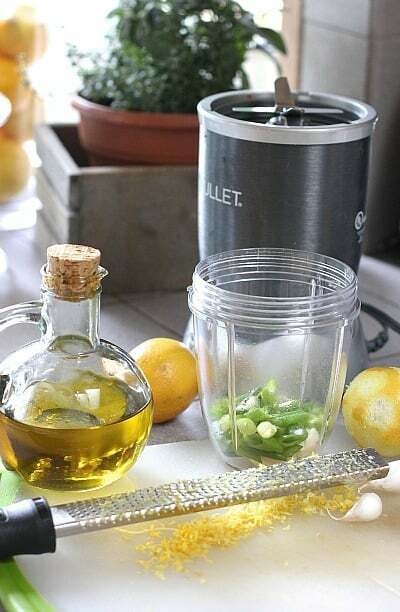 Add garlic, zest of one lemon and juice of one lemon, along with scallions, olive oil, salt and pepper to food processor or blender. Blend for about 20 seconds until well combined and a paste forms. Add to large bowl with marinade and rub into chicken. Getting under skin. Cover and let rest while oven preheats. Preheat oven to 400 degrees. Use convection feature if you have it. No sweat if you don't, just increase cooking time by 5 minutes. Lay chicken SKIN SIDE DOWN ontop of rack. Cook for 20 minutes and turn chicken over. 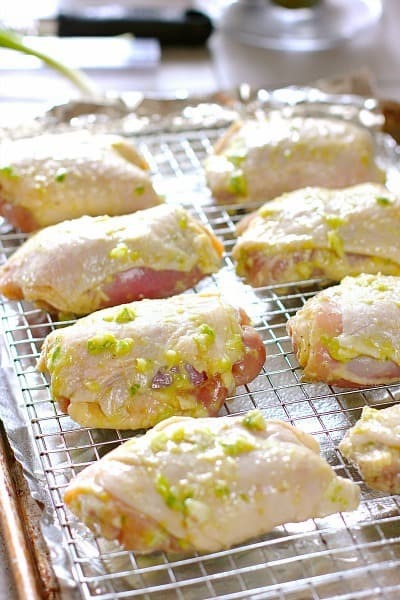 Cook for an additional 25 minutes or until internal temp of chicken reaches 165 degrees. Let rest for 5 minutes and serve! I love the usage of the cooling wrack to make these crisp up all the way around…great tip. They look delicious..
Oven baked and crispy, sounds like a winner. I think it’s so smart bake in on a wire rack so the chicken doesn’t become soggy and to bake it skin side down to help it crisp up. Those crispy chicken thighs are calling to me! Love that marinade and the way you are cooking these. I want some crispy chicken thighs just like this! These chicken thighs look so good! I love how crispy they are! 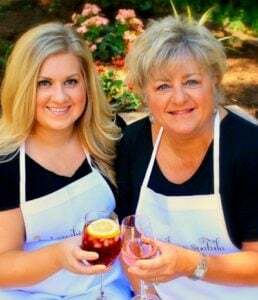 Thanks Marsha! We ate them for 2 days plus lunch for me! 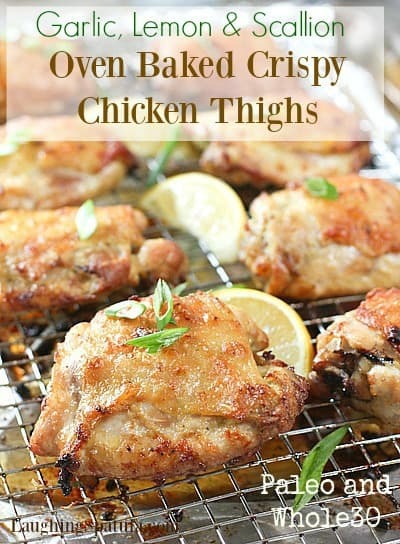 Love a big batch of crispy thighs! Mine didn’t crisp up like yours. What did I do wrong?! Hi Liz – Sorry it didn’t turn out like you wanted…I really have no idea why. Assuming you followed the directions exactly? Did you leave the skin on? ISn’t amazing how good ingredients and simple recipes are the best? 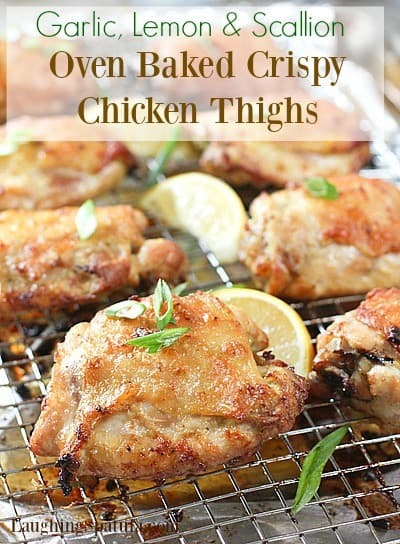 Your chicken thighs look like they are out of a cookbook…perfectly crisp, seasoned just right and ideal to make. Pinned this to make this weekend!! That chicken pieces looks awesome. I am definitely going to pin and make it later. Thank you Lisa! Hope you get a chance to try them! Made these tonight……so freaking delishes! And the recipe was so easy! Thanks for sharing. Making this blogger happy! Thanks…I’m so glad you loved them! That chicken looks amazing. I can’t wait to taste that crispy, zesty skin. Yum. Question do you you mean by turning flipping skin side up? I have read and re-read the instructions and don’t see anything about ‘flipping skin side up’…help me :). I’m probably blind and not seeing it? Chicken was delicious! So my question was on step 10 you say turn. I did flip chicken skin site up and it was really crispy and moist. Did you mean turn the pan? Family loved it and love that it’s whole30. I turned chicken over as it said in step 10, so skin was up in final cook time. Thighs were delicious and crisp!